Ron Edge pulls below a few clippings from his newspaper collection and some other ephemera – mostly photographs from the Peterson and Bros. studio – that move well with the first fairly faithful litho birds eye of Seattle, the one drawn here in 1878 by E. S. Glover. The litho will be printed first followed by the text about it’s creation that Ron found in his collection of old Post-Intelligencers, the P-I for May 31, 1878. 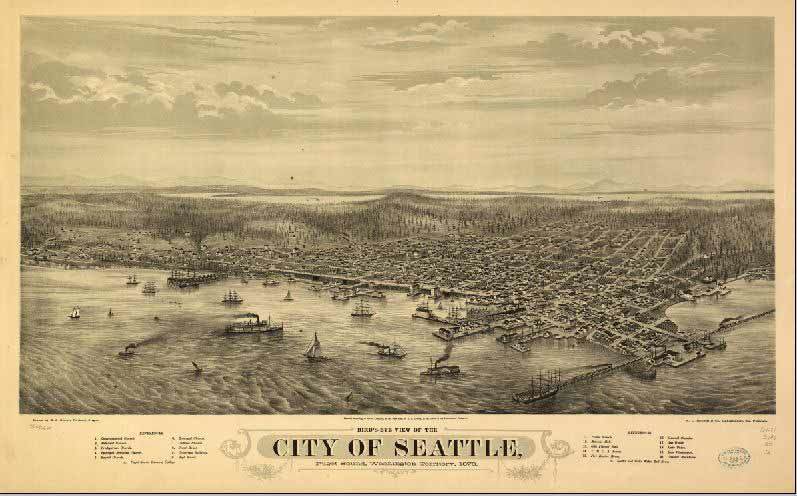 This 1878 Birds Eye was the first such for Seattle. Others would follow in 1884, 1889, and 1891. The one from 1891 is most understandably the most lavish and the artist, like Glover in 1878, attempts to be impossibly faithful to what in 1891 was a city as jumpy as fruit flies in August. In 1891 the population here was over 50 thousand. In 1878 is was under three thousand. Glover and his partner could reasonably expect that nearly all of them would be eager to search into this birds eye for their home and/or business. Lots of the lithos were sold and a few of these examples of tender ephemera survive, some are for sale at a dear price. E.S. 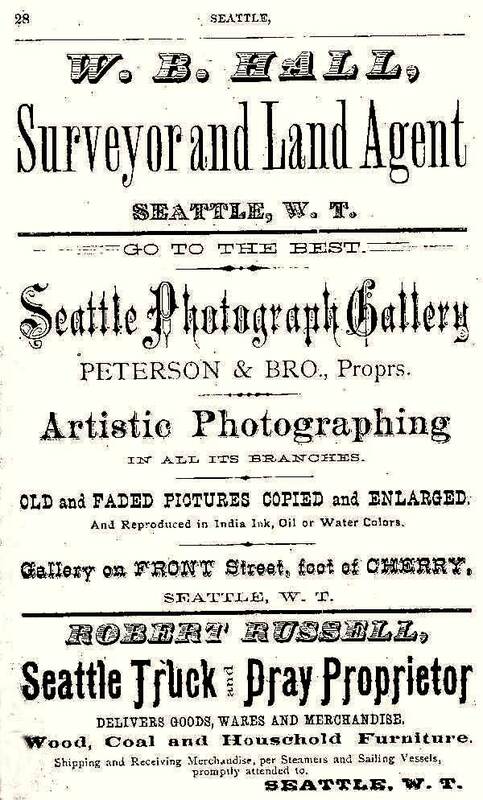 Glover and his unnamed salesman partner did not spend all of 1878 in Seattle sketching and soliciting. That year they did much the same for Victoria, Port Townsend, and Olympia. (Those who wish to ask the roadshow appraiser “And what might this be worth?” can search the web for examples. For instance, a local dealer is asking more than $3,000. for the Olympia litho.) 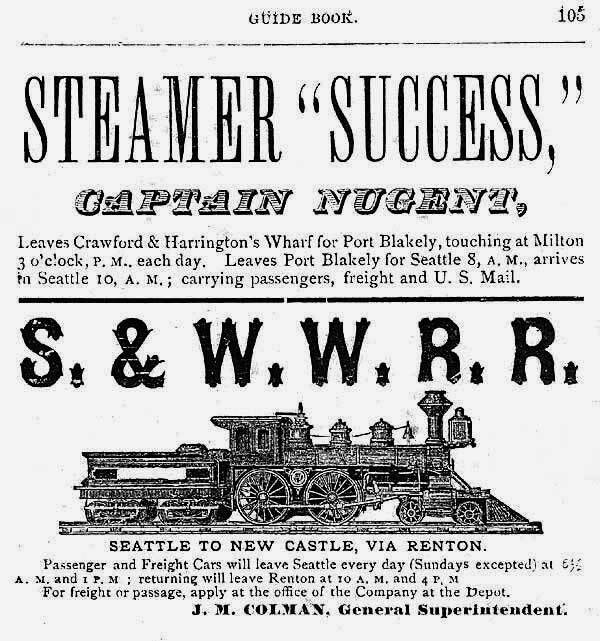 In 1879 the partners move on to Portland. Ten years later they had sketched and printed their way as far as Anniston, Alabama. In the three years before arriving in Seattle in ’87, these artful dodgers made and sold birds eyes in Ogden, Helena, San Diego, Anaheim, Santa Barbara and Salem. Below is a 1879 adver for the S.W.W. 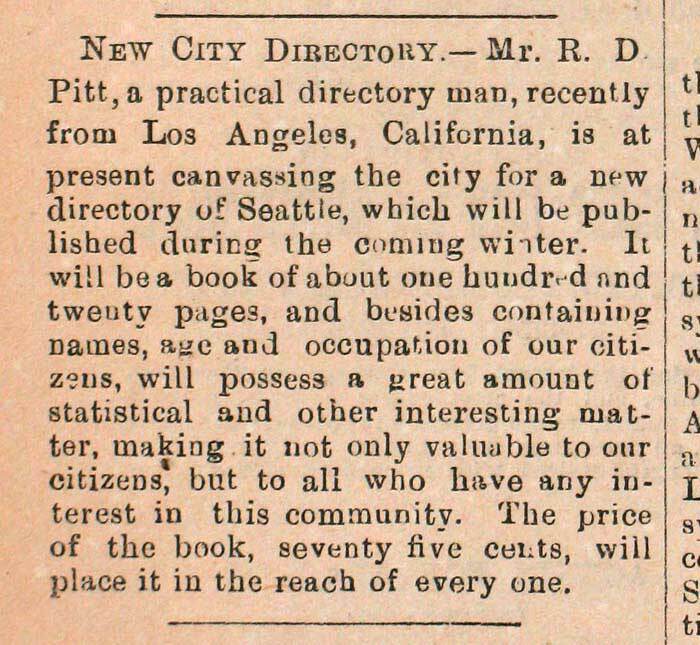 that appeared in the city’s 1879 directory. It is followed by a related Edge Clipping from Jan 31, 1878, about the work done in driving piles for the tideflats trestle to the King Street wharf. Some of the sharpest work of the Peterson and Bros photographers makes wonderful illustration of the 1878 Birdseye. The brothers’ studio was at the waterfront foot of Cherry Street. First, below we print a page from the city’s 1879 directory that advances their competence. And following that we include one of Ron’s recent acquisitions. 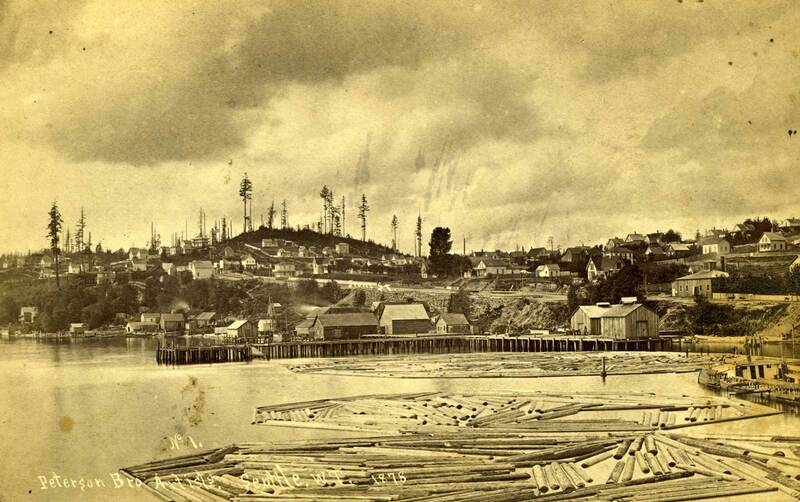 It is easily one of the real classics of Seattle historical photography – a wide view of the waterfront taken by the Petersons from the elbowed end of Yesler’s wharf in 1878. We invite you to compare this pan in detail with the slice of the birdseye from the same year printed above. You will be rewarded with many correspondences. To help, Yesler’s Wharf at the foot of Mill Street (Yesler Way) is the largest assembly of off-shore construction showing to the left of the King Street Wharf in the birdseye. [Making it easy, Yesler’s Wharf is at the center of the scene.] 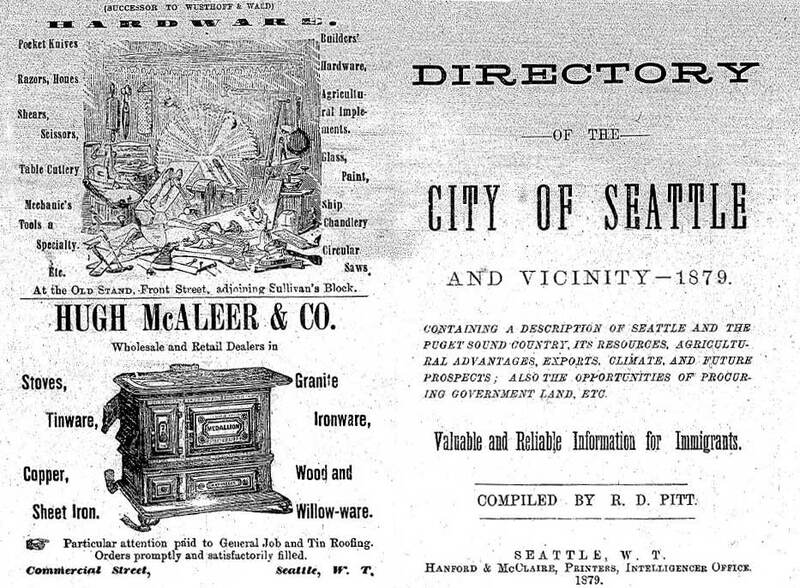 In 1878 it was still the hot spot of Seattle’s transhipment, with hardly any thing else needed in the way of wharfs and waterfront warehouses – except those for coal. Next Edge takes a small section from the above classic and enlarges it as a witness to the sharpness of the Peterson Bros work. The subject looks through the future location of the Pike Place Market to the western slope of the front hump of Denny Hill, which in 1878 was a mere quarter-century from the beginning of its “humiliation” with the Denny Regrade. 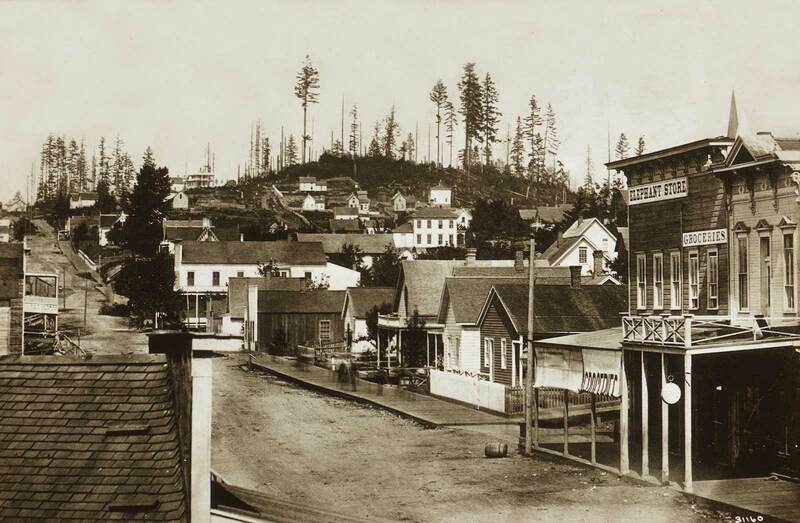 The home on the far right is Orion Denny’s at the northeast corner of Front Street (First Avenue) and Union Street. 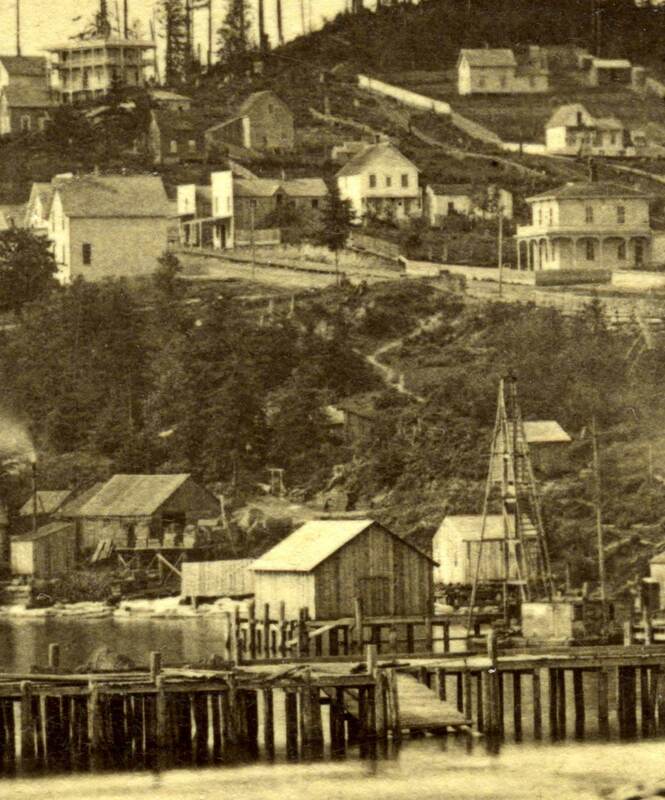 Just below is another Peterson look towards Denny Hill, also from 1878. It shows a smooth Front Street two years after its own regrade. Again, on the horizon is Denny Hill. The photo was taken from the front of the Peterson studio at the foot of Cherry Street. The Elephant Store on the right is at the southeast corner of First (Front) and Columbia Street. 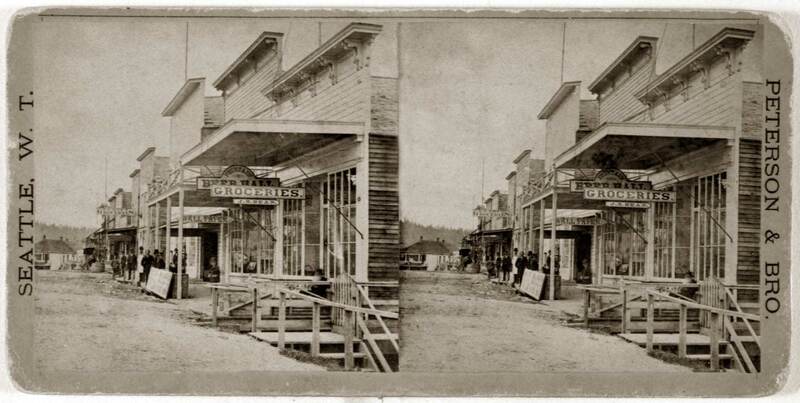 Next descending from the studio onto Front Street and turning to the south, the Petersons show the line of storefronts along the west side of Front Street in the long double-block between Columbia Street and Pioneer Place (Square). Their studio to the rear of one those retailers. According to Ron Edge this stereo is “something I forgot I had.” Considering in what good order is the Edge collection this forgetfulness is uncharacteristic. We print it in stereo so that those among our readers who have a talent for creating three dimensions with these old stereos with out the little hand-held optics most of us need can be about the business of relaxing their eyes into whatever crossing is needed to pull out that always sensational 3-D effect. Next we visit the Petersons – some of them – at home, most likely at the steep northwest corner of 8th Avenue and University Street. This family portrait is most appealing, and the people in it are as well. 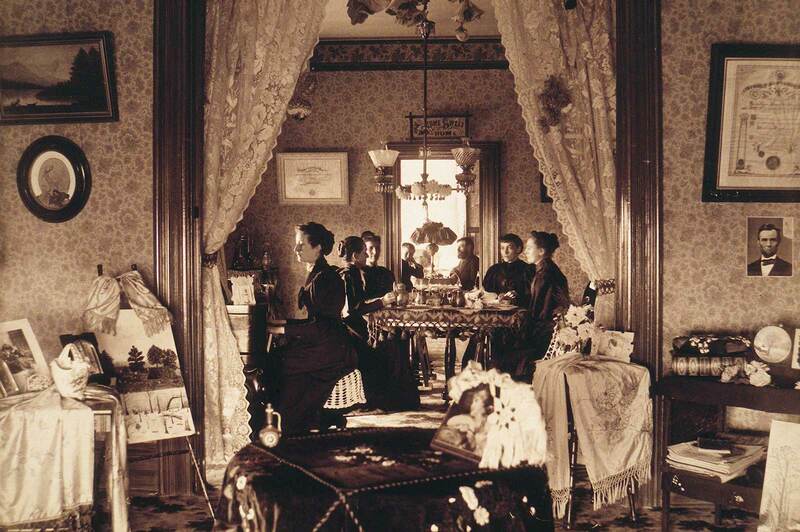 On the far wall is a certificate from a musical academy, and above the door in the same wall is an embroidered sign reading “Home Sweet Home.” The portrait of Lincoln on the right suggests that the Petersons were Republican, the progressives of that day. The many women of this family – some looking like sisters – are separated from the but two men beyond. They – the men – may be in the kitchen. One of the brothers may be behind the camera. It is a liberated family decorated with much of the stuff that was a demonstration of Victorian good culture, and with provincial touches too, like the painting of the mountain, lake and dugout canoe on the left wall. 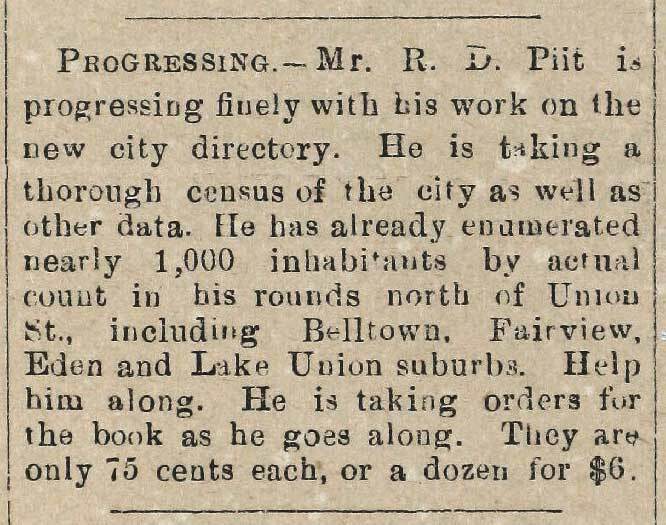 Ron has also pull up P-I clips describing the gathering of information for the city’s 1879 directory. Directory-making was a task considerably more involved than drawing a birds eye, however fine its verisimilitude. This Edge Clipping concludes then with the first page from the 1879 directory.